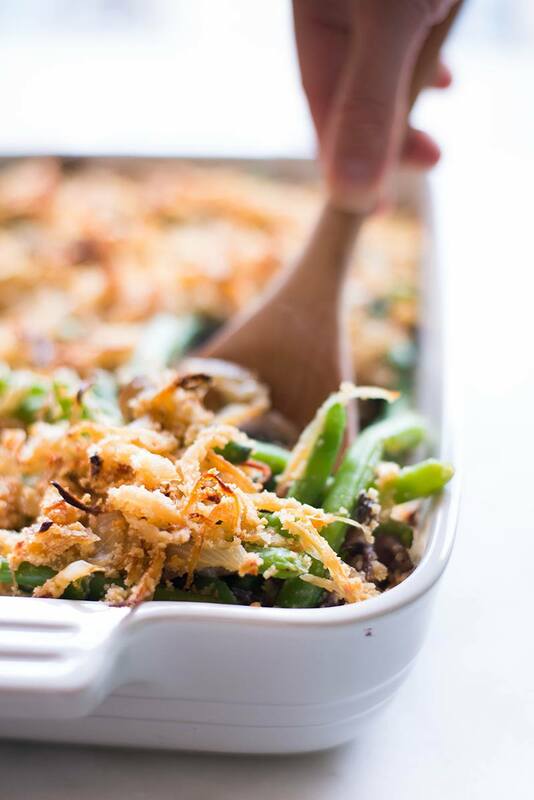 This Thanksgiving, make this Healthy Green Bean Casserole from scratch and wow your guests and your tastebuds! 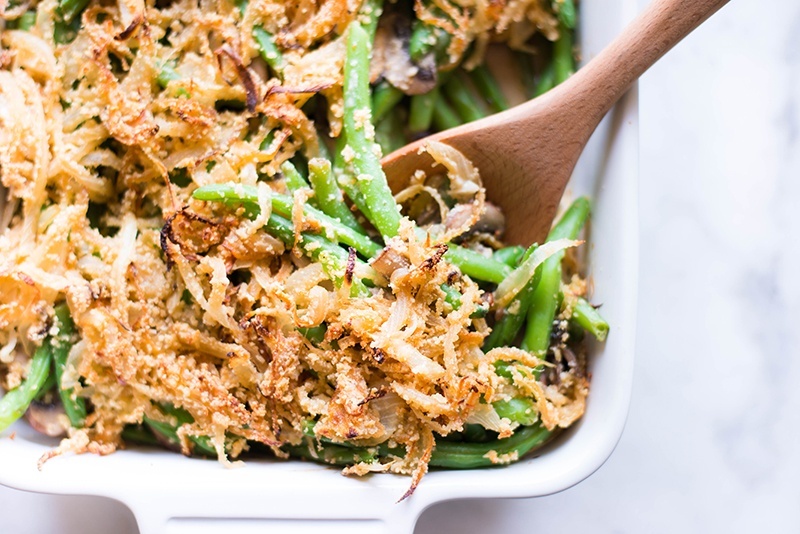 Let me show you how to make green bean casserole healthier by just replacing a few simple ingredients. 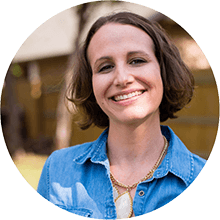 Guys, I am so super duper stoked to share this new healthy Thanksgiving recipe with you. I asked on Facebook and Instagram recently what favorite Thanksgiving recipes you wanted me to #makeithealthy and one of the most requested recipes was a green bean casserole. We got SO many responses and had a blast seeing everyone’s excitement about wanting to eat healthy and still enjoy a tasty Thanksgiving dinner. Because these two things should totes be possible. And they are! Can I get a “yippee”!?!? I actually didn’t grow up with green bean casseroles at my Thanksgiving dinner table. We’d have steamed green beans mostly – maybe with some parmesan – but nothing like what it seems most people enjoyed. Then, as Dustin and I created our own Thanksgiving menu, we’ve usually make these parmesan garlic green beans (which are yummy!). To be honest, I have always found it kinda crazy how the “crispy onion” topping came from a can and people would just open up the can and toss it on the casserole. But, again, I didn’t grow up with it so there’s also that nostalgia around foods from your childhood. Good news, though. I’ve found a healthier, whole, more delicious way to enjoy our green beans this Thanksgiving. And I’m kinda in love, guys. 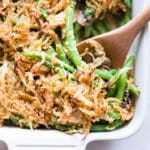 Is Green Bean Casserole Healthy? 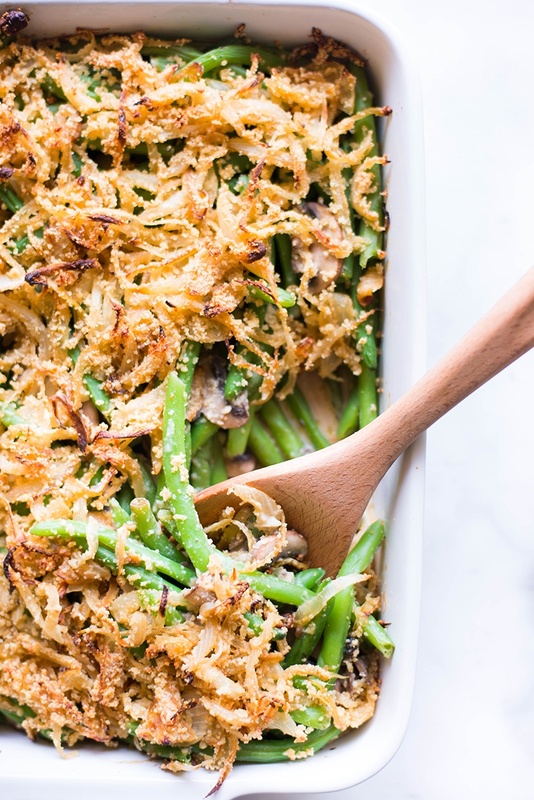 Judging by how many of you asked me to make a healthier version of homemade green bean casserole, I think many of us know it needs a lot of help. 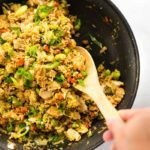 Let’s go over the major changes in this recipe to #makeithealthy to see how to make green bean casserole healthy. To make the onions crispy, I toast almond meal until it’s lightly toasted and then I mix it with the sautéed onions, parmesan, and sea salt. In other words: immense yumminess. This easily replaces the fried, canned, crispy onions and reduces the fat and salt immensely. OMG and then there’s the mushroom sauce on the green beans. Seriously: I could slurp this sauce up just by itself. It’s so dang good. 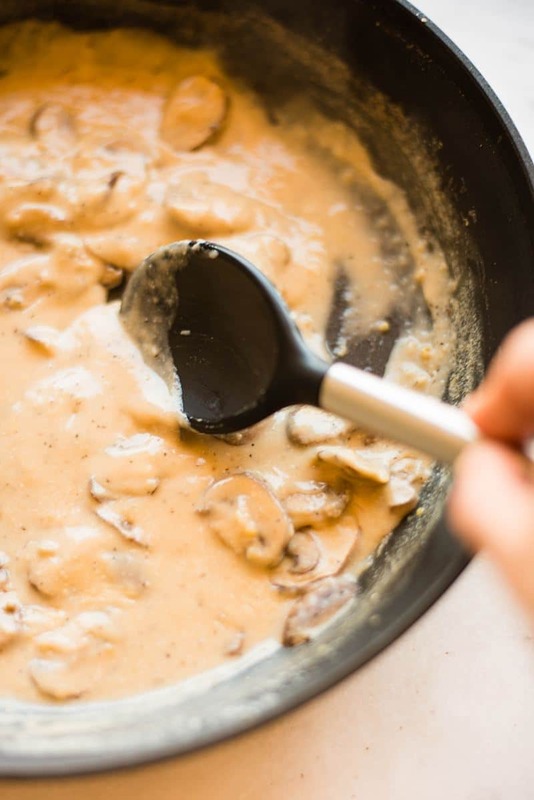 To make the mushroom sauce from scratch, I sautéed mushrooms and garlic and then make a cream sauce by basically combining chickpea flour and some unsweetened almond milk. No canned cream of mushroom, here! One of my best tips for saving time on Thanksgiving Day is to prep ahead anything that will save well in the fridge. 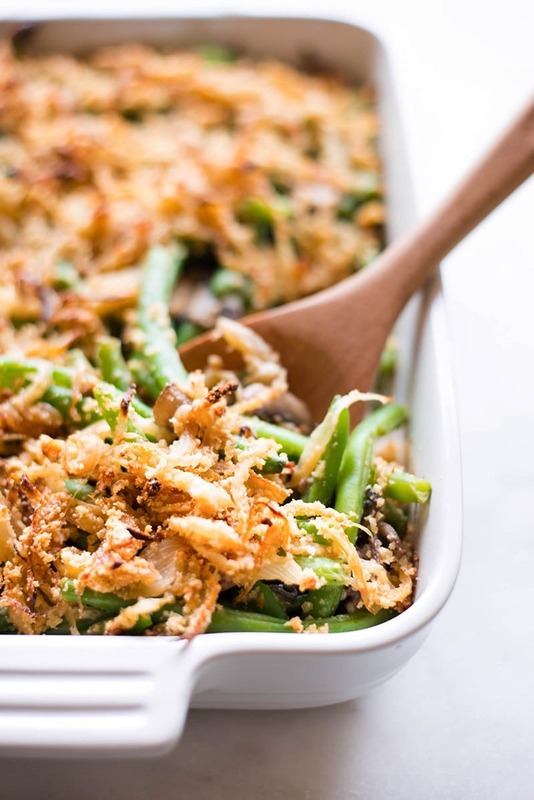 Lucky for us, that includes this healthy green bean casserole. Cover tightly with plastic wrap (can last in fridge if sealed tightly for up to 5 days in the fridge). 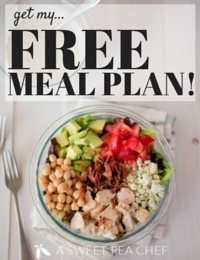 Then, when you’re ready to enjoy this tasty goodness right here, just reheat it in the oven! To reheat, place the green bean casserole, without the lid or plastic wrap, back into a preheated oven at 375 degrees F, and heat for 30 minutes or until heated through. This will make the onions crispy again and will heat everything through perfectly. 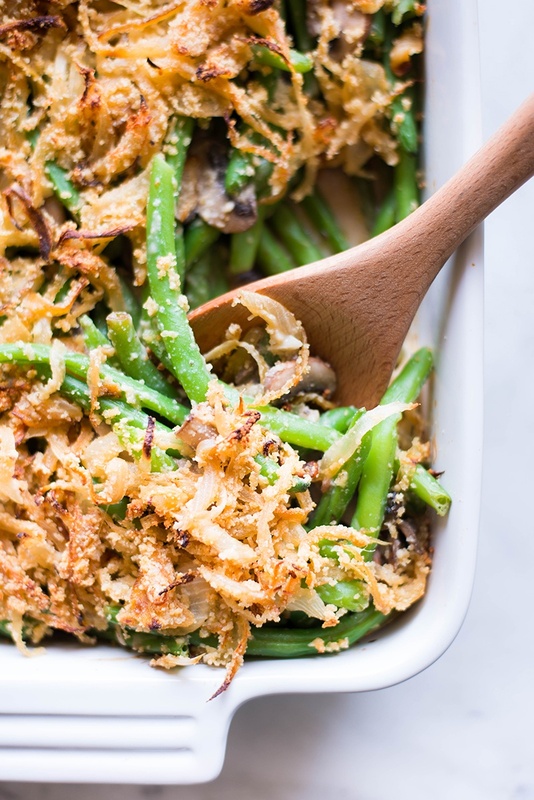 This Thanksgiving, make this Healthy Green Bean Casserole from scratch and wow your guests and your tastebuds! 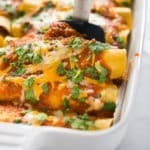 Preheat oven to 375 degrees F, bring a large stockpot of water to a boil, and grease a large casserole dish with olive oil and then set aside. Add the green beans to the boiling water and boil for 4-5 minutes, or until almost tender, but still slightly crisp. 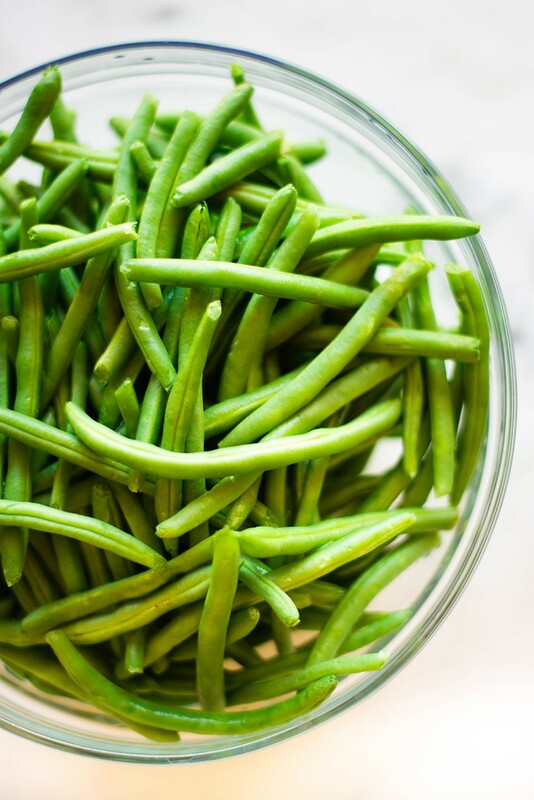 Drain the cooked green beans, then transfer to a bowl filled with ice water to stop them from cooking more. To make the crispy onion topping, start by heating olive oil in a large fry pan over medium-high heat until hot. Add the thinly sliced onions and cook, stirring occasionally, for 5-8 minutes or until they are tender and starting to brown. Remove the onions and place into a medium mixing bowl and set aside. In the same pan you used to cook the onions, add the almond meal. Cook, stirring very frequently, for 3-5 minutes, or until the almond meal is starts to turn lightly golden. Careful not to burn. Remove from heat and transfer the toasted almond meal to the bowl with the onions. Stir in the 1/4 cup shredded parmesan cheese and sea salt, and then toss the mixture until combined. Set aside. In the same pan, heat a little more olive oil until hot and add the mushrooms and cook for 4-5 minutes, or until they are tender, stirring occasionally. Add the minced garlic and cook for an additional minute until fragrant, stirring frequently. Sprinkle the chickpea flour over the mushrooms, and stir to combine. Slowly add the low sodium chicken broth, whisking to combine until smooth. Whisk in the almond milk, and bring the mixture to a simmer. Let cook for 2-3 minutes, or until thickened. Stir in the remaining 1/3 cup parmesan cheese, sea salt, and pepper until the cheese is melted. Transfer the cooked, chilled green beans into the pan with the mushroom sauce and toss until combined. Pour the green bean mixture into the prepared baking dish and then top with the crispy onion topping evenly over the top. Place in the oven, uncovered, and bake for 25-30 minutes, until the top is golden brown. 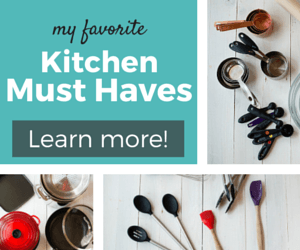 Could I use substitute something for the almond meal? And use regular milk? 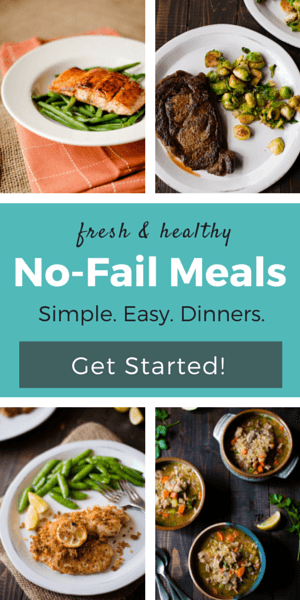 I have people with nut allergies coming, but this recipe looks delish! I really want to try this. My 16 year old son absolutely loves his green bean casserole and I have been trying to make it healthier. He, however, has a tree nut allergy, what would you suggest to replace the almond milk and meal with, to keep it healthy? This looks delicious & I am looking forward to making it for Thanksgiving this week! 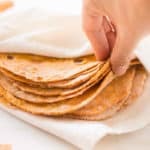 I don’t have chickpea flour, so do you think an alternate gluten free flour would work? I have almond, coconut, arrowroot powder, & a blend of gf flour substitutes. Could you do this in a Crock-Pot? I haven’t tried this yet, but to make it truly vegetarian, I would substitute the low sodium chicken broth with low sodium vegetable stock/broth (in the mushroom sauce). 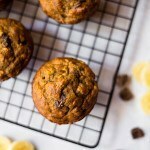 Can I use almond flour in place of almond meal? This was my favorite new Thanksgiving dish we did this year. Yea, it’s so good. Definitely one for the rotation! This is one of my favorite side dishes! 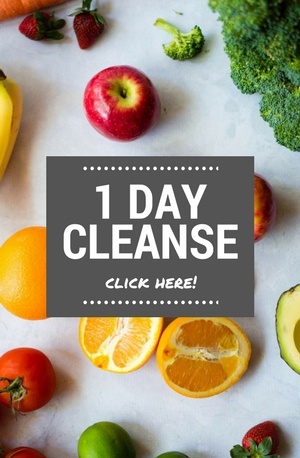 I love the healthier take on it.